Cold winter weather makes my fingers fidget and I have to get going on some woollen crafty project. Crochet is my distraction of choice and I’ve realised that choosing smaller, achievable projects is the best way to achieve (somewhat) instant gratification. I have been eyeing out Repeat Crafter Me’s awesome crochet animal hats for a while now. Last winter I crocheted an ear-flapped hat sans eyes and animal bits but really felt like it was lacking. 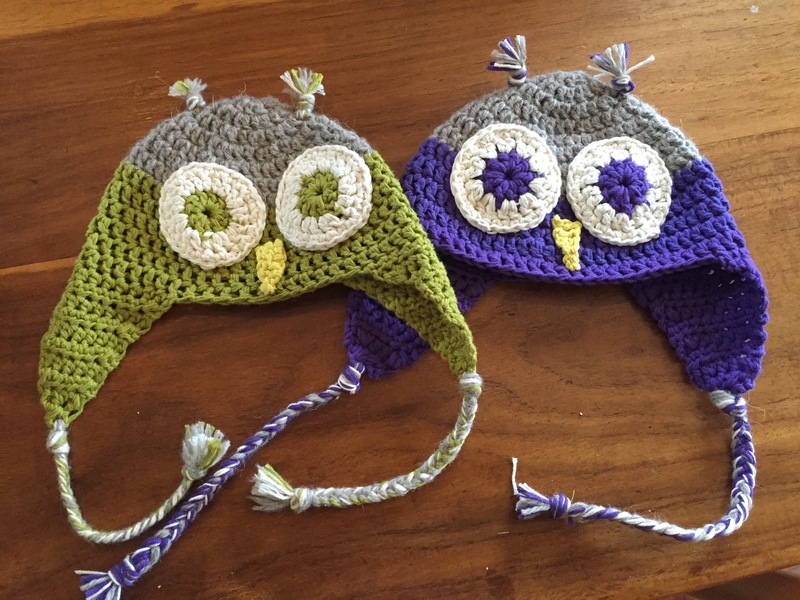 So this winter I dived in and made not one but TWO owl hats (aaah life of a twin mom crafter!). I love the free patterns that Sarah from Repeat Crafter Me so generously shares and as I mentioned, these cute owls were top of my list. So I had no trouble deciding what to make. I love the ear flaps and the cute ear tufts. The pattern is easy to follow and came together nicely although I did have to Google a few of the crochet abbreviations but I think that’s standard practice because I can’t keep those different stitches in my head from one winter crochet session to the next! The additional purple is a cotton blend from a local wool shop gem called Wolmart. A side note on the Orkney wool: Years ago when my sister graduated from Edinburgh University, my family went on a cycling trip from Glasgow to the Orkney islands (as one does…) and while exploring the islands I heard the fascinating story about the local North Ronaldsay Sheep. These sheep have adapted to living on the tidal flats between the ocean and the sea wall and subsist on only sea weed. They eat at low tide and then escape to higher ground at high tide to digest their meal. Their digestive systems have had to adapt to their interesting diet and they would probably suffer if they had to eat grass. Needless to say, after hearing about these sheep, I HAD to track down some of their wool so that I could thread their story through my own creations. I meandered through the wool shops of the little villages and did eventually find some authentic wool which I have been hoarding since then. 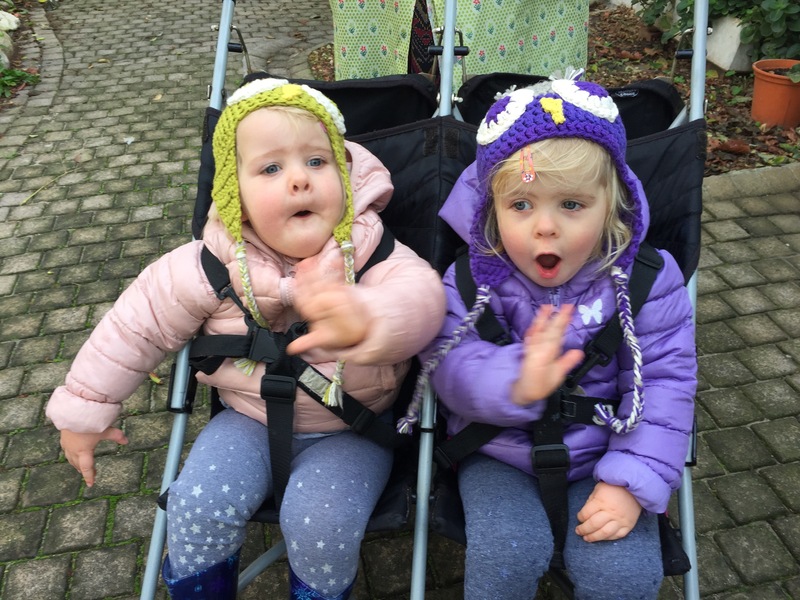 And what better project to use it on that warm owl hats for my girls. The wool was so great to work with and felt so good in my hands. I’ll have to come up with another suitable project for the rest of it! I made the ‘toddler’ size hat in green first but after Little A took a particular liking to the “gweeeenn” one, I realised that her plus size head probably wouldn’t fit into it for much longer, so the next one in purple was in the ‘child’ size. It’s a little big but I think a better fit and at least there’s a chance they can wear it next year too. 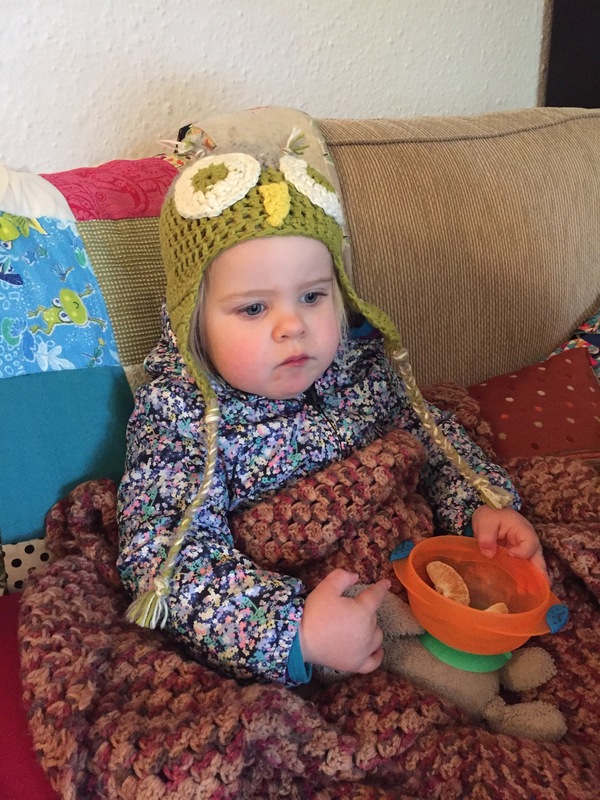 The girls love their owl hats – particularly the green one – and if it’s one item of winter clothing we can get them to put on voluntarily, then it’s a definite win! 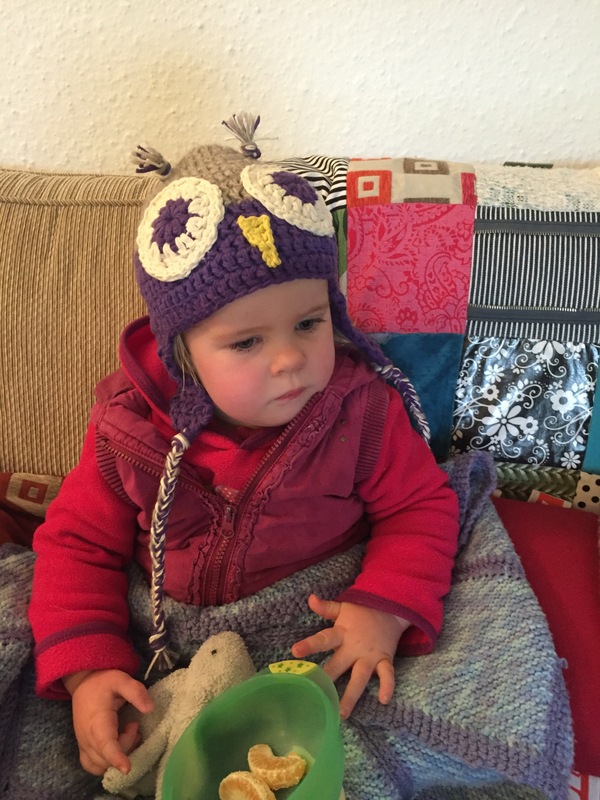 Pattern: Owl hats from Repeat Crafter Me in size Toddler and Child; I left off the button eyes…for now. Do it again? : I’m keen to make matching adult ones for mom and dad!